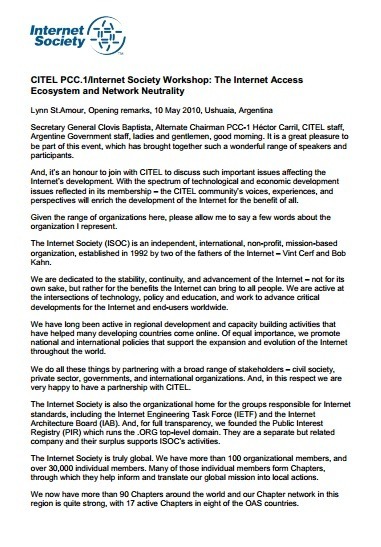 Buenos Aires, 12th of March 2018 – The General Secretariat of the Organization of American States (OAS), through its Inter-American Telecommunication Commission (CITEL), and the Internet Society (ISOC), a global organization that promotes the development of the open Internet, signed a collaboration agreement to promote the creation of new community networks that provide access to rural and remote areas of the Americas. The agreement is signed responding to the commitments of the ICT Alliance 2030 for the Americas – signed in Santo Domingo on June 14, 2016 -, especially those where it is agreed to “Work together in order to contribute to the global goal of connecting 1.5 billion more people for the year 2020 “and” Promote digital training and contribute to improving the quality of education and developing talents for the new digital economy“. Develop at least 15 Internet Community Networks in rural and remote areas of the Americas. Provide technical training to 150 inhabitants of rural and remote areas to be themselves who build community Internet networks and promote their use in other regions. Make sure that at least 3 countries in the region adopt policies that allow the creation of enabling environments to provide access to the Internet through community networks. Create a regional event to raise awareness about the importance of implementing community networks and share experiences of best practices to carry them out. “This agreement is part of the need to sign an Alliance to support the member states of the Organization of American States on their way to integrate ICT in national policies within the framework of the 2030 Agenda for Sustainable Development, which recognizes the great potential of global connectivity to accelerate human progress, reduce digital gaps and develop knowledge societies “ stated Oscar Leon, Executive Secretary of the Inter-American Telecommunication Commission of the OAS. “Supporting and empowering communities to build their own forms of connections is genuinely a new way of thinking,” explained Raúl Echeberría, Vice President of Global Engagement for the Internet Society. “Together we must recognize that connectivity can be promoted from a village or a city and that we can help with innovative access to spectrum mechanisms, which is a great step forward in that direction,” Echeberría concluded. In this regard, the Internet Society (ISOC) recently presented a report outlining the policy initiatives that governments, the private sector and local actors can take to expand Internet access in underserved communities and remote areas. In support of the United Nations Sustainable Development Goals (SDG), and with half of the world’s population still disconnected, the report highlights the need for new political initiatives to connect the places on the planet that are most difficult to reach. The report examines the various ways in which community networks can access the spectrum, including unlicensed use, sharing of the licensed spectrum and the granting of innovative licenses. Network operators can also play a key role in helping community networks. The report also includes recommendations for operators such as access to backhaul infrastructure at fair prices, sharing equipment, training, infrastructure, spectrum, etc. Internet Society signs agreement with the African Network Operators Group (AfNOG) to support an improved offering of network technology training programs in Africa.